Gear Demonstration and Transformation of Energy. he model clearly shows how various, most widely used Gears Work and also demonstrates how Electrical Energy can be converted into mechanical energy. 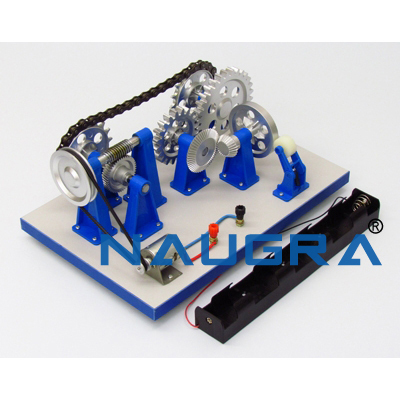 The unit consists of a mounted motor which is connected by a belt and pulley to a train of different kinds of Gears. The various kinds of gears demonstrated are, Straight Bevel Gears, Worm Gears and Spur Gears. The transformation of Energy Motion is demonstrated by Pulley Belt working, Gears connected by Chain working (bicycle) and transformation of energy to a wheel. 12 inch (300mm) x 8 inch (200mm) x 0.60 inch (15mm). Height of unit, taking into account the tallest part 5inch (125mm). Gears vary in diameter, smallest being 1 inch (25mm), biggest being 3.75inch (95mm). The motor works on 6v dc, battery holder for 4 D cell batteries supplied. Batteries not included. A preview of the included instructions can be found at the bottom of this listing. 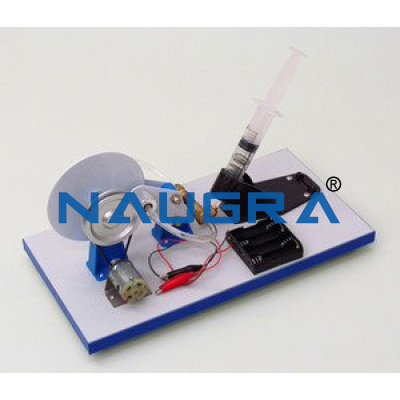 Other Related Teaching Lab Products, Scientific Instruments and Educational Equipments like Gear Demonstration and Transformation of Energy. . .